Just back from a very cold, very windy, very snowy week based at Kokelv in the far north of Norway, a short distance from The North Cape. In reality the weather was nowhere near as cold as it can get at these latitudes in late March, but following a run of trips to exotic, tropical destinations it was certainly cold enough for me! 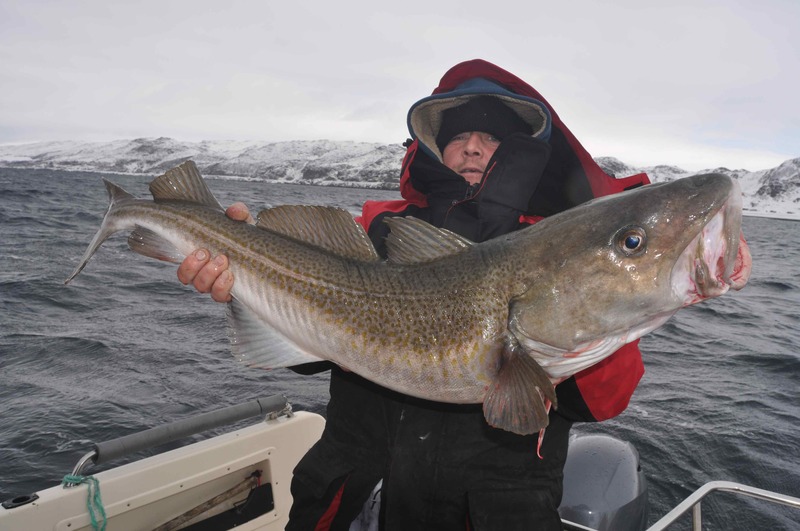 Kokelv is a prime location at which to intercept the annual run of ‘skrei’, the big run of outsize cod that migrate from the Barents Sea to spawn in the northern Norwegian fjords between February and April. The weeks prior to our trip the word from other key locations in the region such as Soroya, a short run from the mouth of the Revsbotn Fjord in which Kokelv is located, was that the fishing was incredible, with lots of 30, 40 and 50lb plus fish, and even bigger specimens up to 90lb having been caught. Local fishermen working jigging machines, we were told, had had to cut back from using 8 to 5 lures on their lines, as they were catching so many outsize fish! Like most Norwegian fjords Revsbotn offers a good amount of shelter, offering a lee shore from which to fish given all winds other than those blowing out of the north-west. 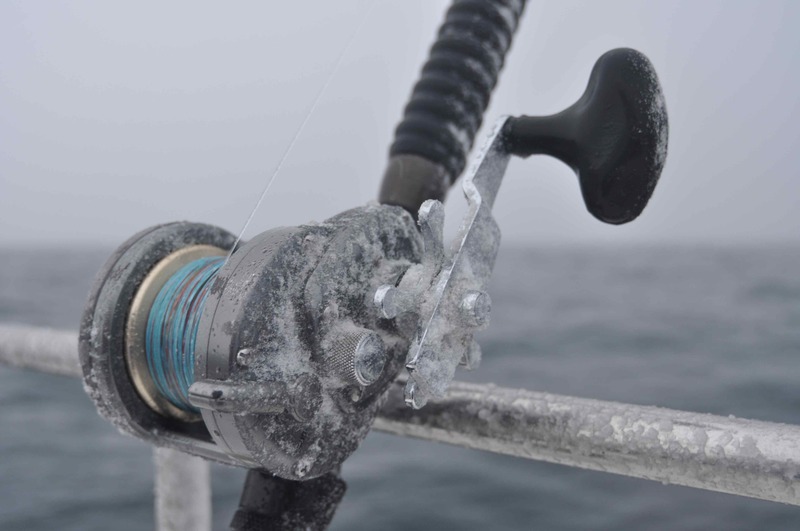 Of course the wind during our 6 days was almost exclusively a nor-wester, and it was so strong that on our first day we were unable to fish, not the best start to any trip. We did get out each day for the rest of the trip, with conditions varying from a rough to relatively calm sea, along with frequent, heavy snow storms. Guess what the weather was like the day we left? Yes you’ve got it, perfect, the sea mirror calm beneath a clear blue sky with similar conditions forecast for the next week! 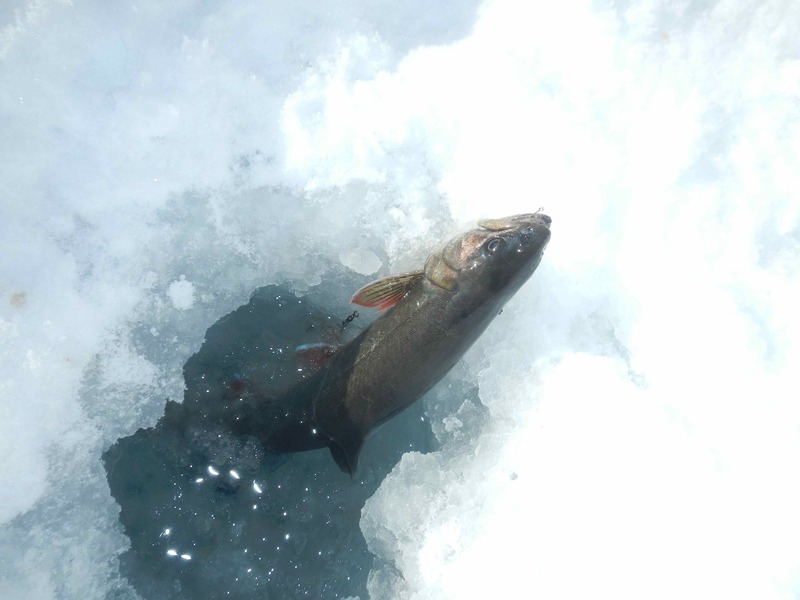 Yes the fishing was tough, very tough at times, but by the end of the trip our biggest cod was 44lb, we had caught at least 4 fish over 30lb, 20 over 20lb and a lot of double figure fish. 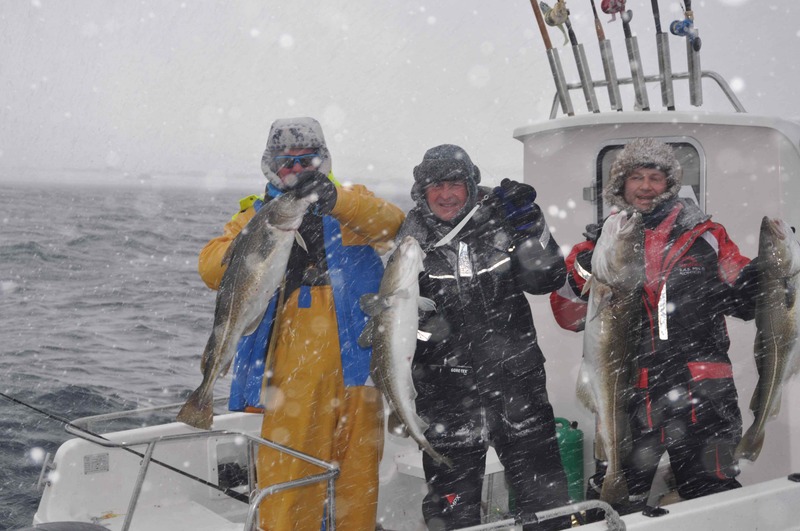 Variety came our way with some decent wolffish and haddock and at least one big halibut was lost, so all in all, given the conditions, a fair weeks fishing. At times conditions were challenging! The thing is, these days Norway has become a victim of its own success. Too many anglers traveling here on their first trip have convinced themselves that the fishing is going to be easy, and that they are ‘guaranteed’ to catch lots of fish including fish up to the 40-50lb range. 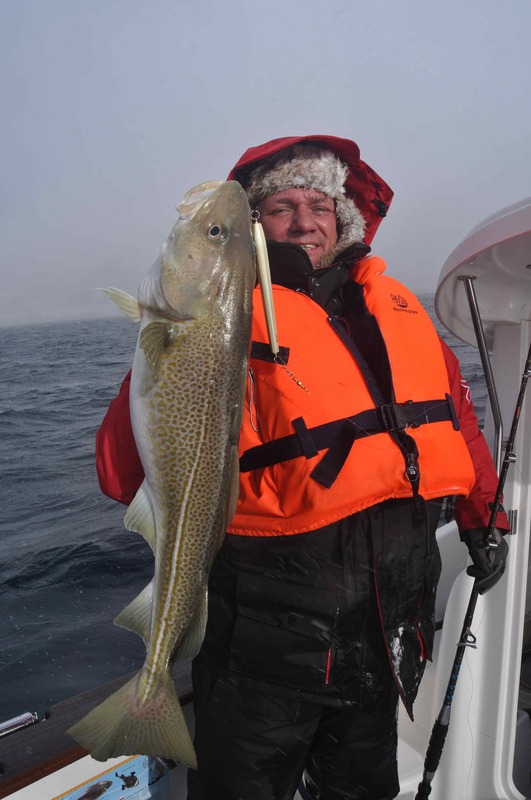 Well the reality is it’s not that easy and while the fishing can be truly spectacular, even ridiculously easy at times, the fishing in Norway can be as fickle as the fishing anywhere, and nobody can control the weather. Time for coffee I think! Early season trips such as this one do offer your best ‘chance’ of hooking a massive cod, a fish in excess of 50-60lb, but my advice to anyone planning their first trip to this amazing sea angling destination would be to book a trip between late May and the end of September. At this time of year there are a lot more fish around, including plenty of cod in the 20-40lb range, and aside from an improved chance of getting favourable weather, you have a lot more hours of daylight to work with if the weather is against you. 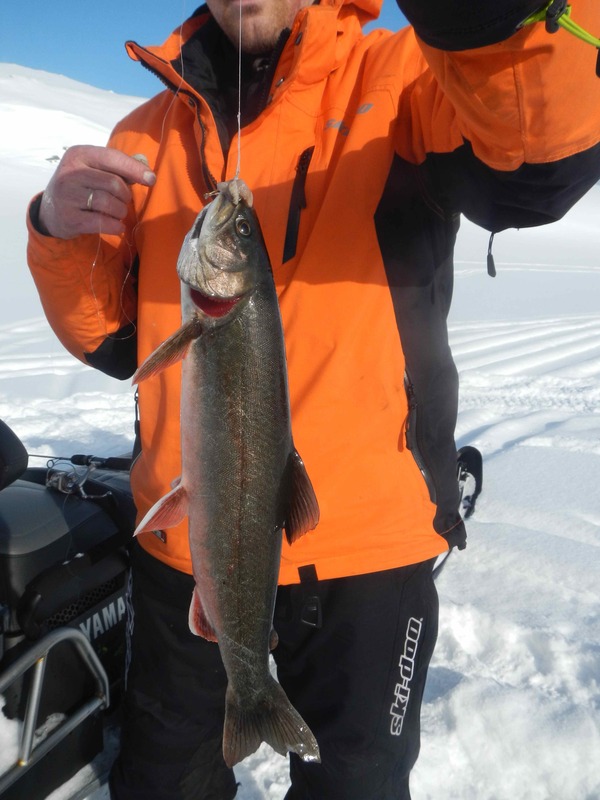 One of the highlights of this trip for me and those clients who joined me, were skidoo trips into the mountains above Kokelv, to fish through the ice of the many frozen lakes for arctic char and trout. 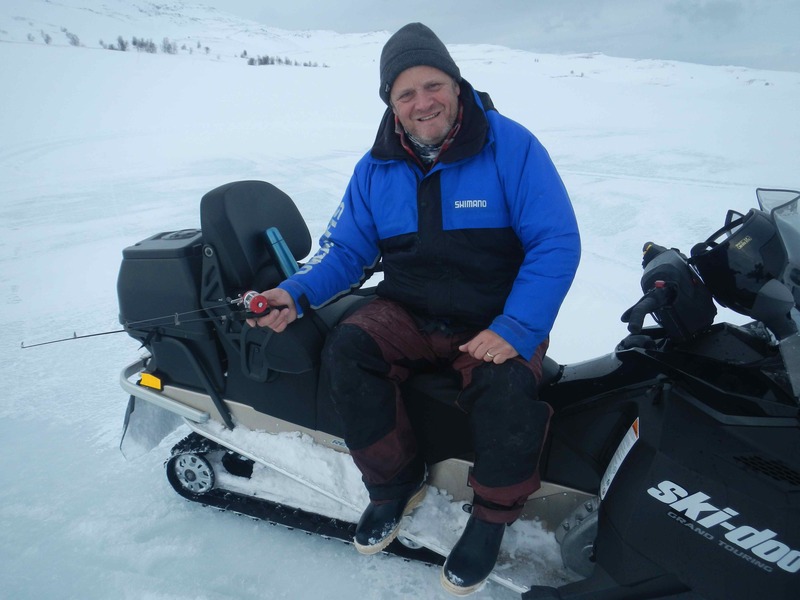 This is a great way to get a true feel for the remote vastness and beauty of arctic Norway, and fishing through a self-drilled hole in the ice certainly has its own special appeal! 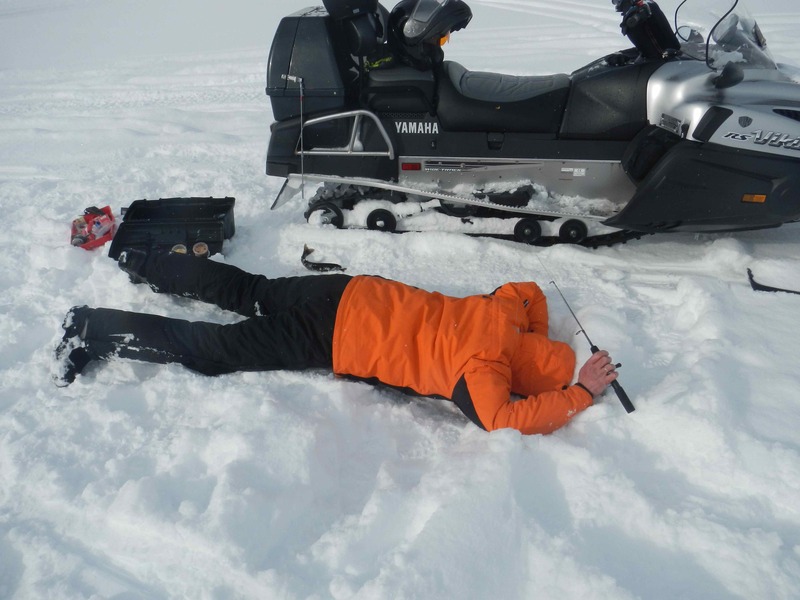 Fishing aside, roaring across a vast expanse of virgin snow at speeds of up to 80kph is a real adrenaline rush, a combination of ‘Easy Rider’ meets ‘Frosty the Snowman’ with a pinch of ‘Mr Crabtree’ thrown in for good luck! Sam fishing for char. 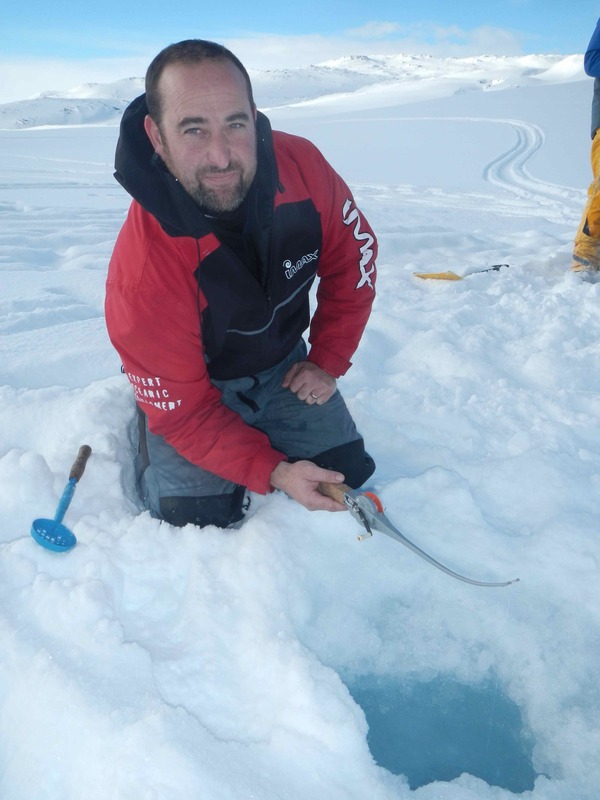 Note the scoop, essential for clearing rapidly forming slush out of your hole! 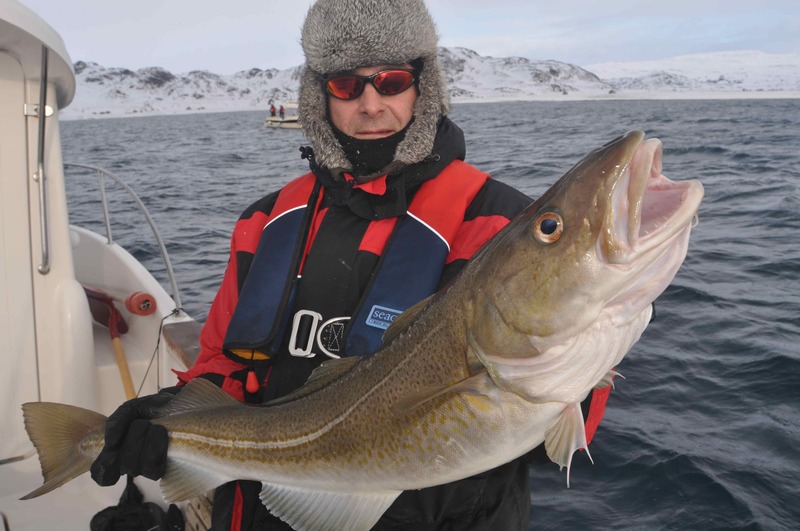 Anglers World Holidays were the pioneers of saltwater sport fishing in Norway here in the UK, and today represent many of the very best camps. If you are interested check out their website at: http://www.anglersworld.tv or Tel: 01246 221717.